Matt. 6:24 “No one can serve two masters; for either he will hate the one and love the other, or else he will be loyal to the one and despise the other. 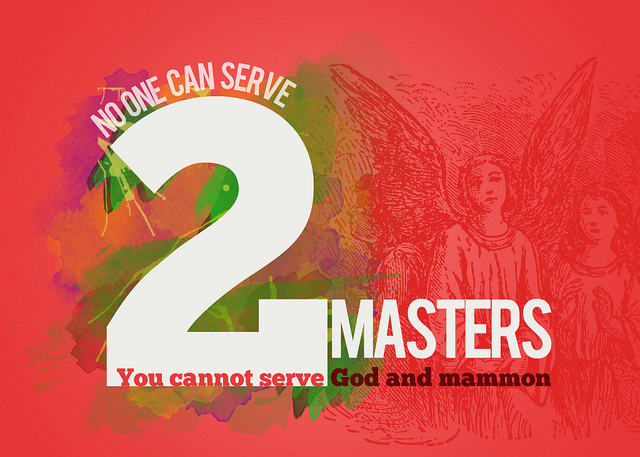 You cannot serve God and mammon. One of the most destructive things in a person’s life has to do with what Jesus spoke about in these verses of scripture, in which Jesus tells us of two different masters. One of those masters is God and the other mammon. God is of course a Spirit, therefore it is very clear that mammon would not directly refer to some type of material thing, but in fact mammon has to do with five different demons. The five demons that make up this spirit of mammon are: poverty, lack, lust, greed, and debt. When you look at how demons work as a team there is always a chief demon. Just as when Jesus came to the mad man at the Gadarenes even though he had a legion of demons only one spoke to the Lord. Poverty is the chief demon that speaks on behalf of lust, greed, debt, and lack. This demon of poverty will try to convince you of many different things, of which those things will relate to one of these four other demons. For example the spirit of poverty will work to get you to lust for things you either should not have or get you to desire something so much you will do anything to get it. Poverty does so by trying to convince you that you cannot live without things to the degree you will lust after them instead of chasing after God. Poverty will get you into debt by going beyond your word to repay. It is not a sin to borrow money, but to be indebted to someone else means you have gone beyond your word and you cannot repay them. Now you are indebted to that person. Poverty convinces you that without these things you are a nobody, and that your perception of yourself is based on what you have or don’t have. Poverty will work at getting you to become greedy by teaching you the worlds system of getting ahead, which then when manifested in greed will cause you to do whatever it takes to climb to the top of the ladder, even if it hurts others to get there. Poverty will cause you to lack what you need by working to destroy what you have through your words and your belief system. Lack comes as a result of saying the wrong things and also by living under the lie that nothing works for you. So if we are going to serve God and not these demons that make up mammon we are going to have to expose this demon of poverty and deal with it head on in faith. What many don’t realize is how this demon of poverty has in fact already so conditioned their thinking that they don’t even realize they are being influenced by it. I know in my own life it has been a struggle for me to deal with. I was raised the same as so many others that were brought up to trust in the world’s system and not God’s. This begins for many at a very early age. I was taught to borrow money for the sole reason of establishing good credit so that I like others would only look to who could loan me money as the way to get the things I needed. But God is the One who desires to meet all our needs. As I said earlier it is not a sin to borrow money because God told the children of Israel that He would make them to lend and not to borrow. So if it is wrong to borrow then the children of Israel would be aiding others in sin. But this demon of poverty teaches us that if we are going to have anything we are going to have to borrow money, but this in fact of course is not so. This demon of poverty is at work even in the lives of the rich, because remember it is not necessarily referring to not having money, but this demon of poverty will convince you that you will never have enough, or that you may lose what you have. This demon was at work in Job’s life for Job had a lot of possessions, and yet when he lost everything Job even said that the thing he greatly feared had come upon him. Where do you think that fear came from? It wasn’t from God but instead from this demon of poverty that had gotten Job into fear of losing what he had. This is what gave this demon the right to strike Job’s life. For the born again believer one of the ways you can know that this demon of poverty and therefore mammon is still affecting what you think and what you believe has to do with tithe’s and offerings. Whenever you are in a church service for example and they prepare to receive tithe’s and offerings and you think it’s about money; that is a sign that this demon of poverty is still affecting your thinking. Giving to the work of God is not about money, it is about honoring God and impacting the lives of others. I understand there are those ministers who are after your money, but as Paul stated to the Philippians he wanted to see the fruit that would about to their account for giving. Phil. 4:16 For even in Thessalonica you sent aid once and again for my necessities. Phil. 4:17 Not that I seek the gift, but I seek the fruit that abounds to your account. Paul was telling these Philippians that he was not after their money, but after winning souls and helping people to be set free. This is fruit that would abound to their account for helping him to preach the gospel. Every time we give to the work of God we literally hold in our hand someone’s salvation, healing, answer from God, deliverance, etc., that they will receive through hearing God’s Word preached. Giving is not about money, it involves money, but giving is about seeing the fruit that will come as a result of that giving. So how do we deal with this demon of poverty and not give in to mammon? You must become a doer of the Word where your finances are concerned. James clearly states here that the person who hears the Word but does not put into practice what the Word of God says they are self-deceived. When you are deceived you don’t know it or you wouldn’t be deceived. Notice in verse 25 he declares that those who look to the Word and do what it says they will be blessed in what they do. If you want to overcome poverty you must stand up to this demon and you do so by faith, but faith if it has no corresponding action is dead. The doer of the Word is the one that will be blessed. 2 Cor. 9:6 But this I say: He who sows sparingly will also reap sparingly, and he who sows bountifully will also reap bountifully. 2 Cor. 9:7 So let each one give as he purposes in his heart, not grudgingly or of necessity; for God loves a cheerful giver. 2 Cor. 9:8 And God is able to make all grace abound toward you, that you, always having all sufficiency in all things, may have an abundance for every good work. If you believe the Bible then you believe in all that God’s Word says. If you sow sparingly you are going to reap, but you are going to reap sparingly. You don’t notice much when you reap sparingly. But God’s Word is true, if you sow sparingly you do reap, but you reap sparingly. But if you sow bountifully you will reap bountifully. In talking about these verses if your mind begins to think solely of money and you think that is what a teaching like this is all about, you have already missed it. The only way you show poverty that it is not your Lord is to live contrary to what this demon says you can’t do. The Word of God clearly states that if you sow bountifully you will reap bountifully. This demon of poverty gets you so focused on money that you don’t think you can sow bountifully. It conditions you to live under the dominion of the kingdom of the world instead of the kingdom of God. Just as with any area of our life you must take God at His Word, and then do what His Word says. God supplies seed to the sower, and bread for food, and he multiplies the seed we sow. To defeat the demon of poverty and not serve mammon you must stop looking to money as your provider and look to God. God provides seed to sow, and bread for food, but if we don’t sow bountifully, we don’t reap bountifully. We continue to live under the rule of mammon thinking we can’t do what God’s Word says. But we can. Our obedience to God will break the back of this poverty demon and will deliver us from mammon. So seek God as you give. Honor what He tells you to give and you can get free from the rule of mammon. where do you get “The five demons that make up this spirit of mammon are: poverty, lack, lust, greed, and debt”? Was that your opinion or do you have actual evidence of this? Dr. Lester Sumrall who was one of our Pastor’s spiritual fathers had the Lord reveal these to him. Mammon itself being based on wealth, possessions, and coveting things get control of people’s lives through these works of satan. You can connect each one of these to people serving mammon.